Vietnamese Sandwich, or Bánh Mì, is arguably Vietnam's most well known and welcome export. This Vietnamese "sub" is tasty served as breakfast, lunch, dinner, or as a snack anytime. Although the term bánh mì only means bread without any fillings, the term is used to refer to a type of meat-filled sandwich found in Vietnamese bakeries, especially in US, Canadian, Australian, and French communities with substantial Vietnamese immigrant communities. In the Vietnamese language, the term bánh mì is not enough to describe the type of meat-filled sandwich. However, even in Vietnam, "a bánh mì for breakfast" implies a meat-filled sandwich for breakfast, not just bread. Combine carrots, radish, salt, and sugar in a small bowl and toss to coat. Allow to rest 10 minutes until liquid has been drawn out of vegetables and salt and sugar are completely dissolved. Add vinegar and water and transfer to small, seal-able container. 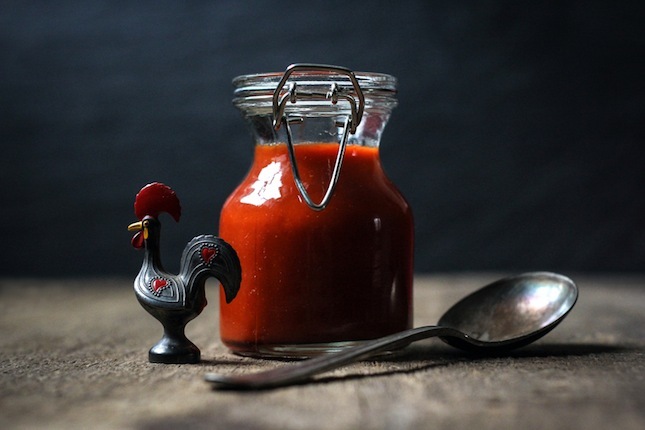 Let sit at room temperature for 1 hour, or for best results, allow pickled to rest for at least 3 days in the refrigerator. Preheat oven or toaster oven to 400°F. Cook bacon in a 10-inch nonstick skillet over medium-low heat until crisp and rendered, flipping once halfway through cooking, about 10 minutes total. Transfer to a paper towel-lined plate (leave bacon grease in skillet). Increase heat to medium high and heat until bacon fat starts lightly smoking. Add eggs, immediately reduce heat to medium, and cook, spooning hot bacon fat over egg tops as they cook until set to desired consistency (I like my yolks runny and white edges crisp). Transfer eggs to paper towel-lined plate with bacon. Toast bread in oven or toaster oven until hot and crisp, about 3 minutes. Split in half lengthwise, leaving a hinge. Spread both sides with mayonnaise and a few dashes of Maggi seasoning. Layer bacon strips along bottom and top with eggs. Top with pickled carrots and radish, cucumber slice, cilantro sprigs, and chilies. Season with salt and pepper. Sriracha to taste. 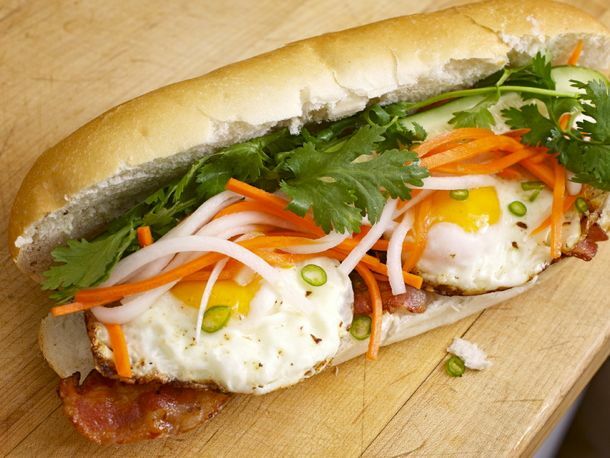 but the breakfast banh mi, is here to give your regular egg-on-a-roll a run for its money. all on a crisp bun. *Substitute Jicama or young Turnips, if you cannot find Daikon Radish. In a bowl, toss together the carrots, cucumbers, daikon, vinegar, sugar and salt and let stand at room temperature for at least 30 minutes. Heat oil in a large skillet over medium-high heat. Add the remaining 3 tablespoons scallions and the garlic. Cook, stirring, for 1 minute. Add pork and cook, breaking up with a fork, until no longer pink, 7 to 10 minutes. Stir in 1 tablespoon chili sauce and the fish sauce, pepper, salt and sugar. Remove from heat and stir in the basil, lime zest and lime juice. Let cool 5 minutes, then add mayonnaise mixture. Fill bread with pork mixture. Press the Jalapeño, mint and cilantro sprigs into the pork. Spoon some pickled vegetables onto the sandwiches and serve any extra alongside. Whisk together the shallots, garlic, fish sauce, sugar and pepper in a small bowl. Place pork slices in a large Ziploc bag, pour in marinade, seal bag and toss to coat well. Open bag and reseal, removing as much air as possible. Place in the refrigerator and marinate at least 1 hour, or up to 24. Thirty minutes prior to making the meatballs, transfer the pork to the freezer to firm up. Using a food processor, add pork and process until you have a sort of pasty ball. 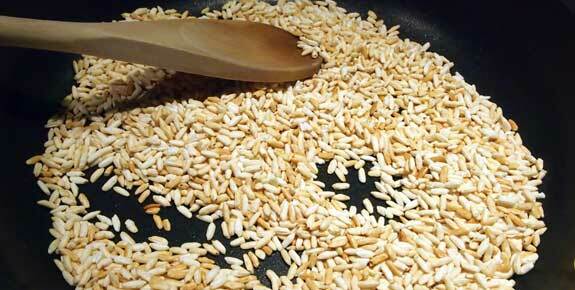 Add the toasted rice powder and process to combine. 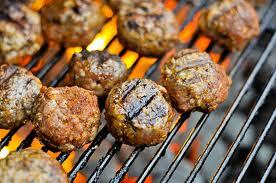 Form meat into into balls about 1 to 1 1/2 inches in diameter. Grill meatballs over medium-high heat. Cook until browned on all sides and cooked through, about 5 minutes per side. Remove from the grill and let cool for 5 minutes. 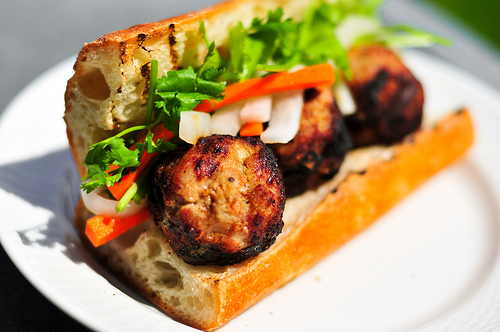 To assemble the banh mi, place pickled carrots and daikons in the baguette, add the meatballs, and stuff in a handful of cilantro and serve. If you don't want to grill these, you can cook them in oven instead. Start by setting a skillet over medium-low heat, then add the rice into the skillet and stir and shake every few seconds to make sure the grains are evenly toasted. Do not be tempted to use high heat to speed up the process, your rice will only be undercooked on the inside and burnt on the outside. And since burnt equals bitter, you don’t want that. After 10 minutes or so, the grains will turn medium brown. (They should now resemble brown rice in color.) Remove the skillet from heat and let the rice cool completely. Toasted rice fresh off the stove is very, very hot; I wouldn’t touch it with my hand. Grinding toasted rice while it’s still hot is also a bad idea; it could cause the motor of your coffee grinder to overheat if you choose to grind it in a coffee grinder. Once the rice has cooled, grind it in a mortar or a coffee grinder, two tablespoons at a time, until a fine powder is achieved. (The texture of pulverized toasted rice should resemble that of stone-ground wholewheat flour — albeit just a tad coarser.) Store your toasted rice powder in an airtight container and keep in the pantry.